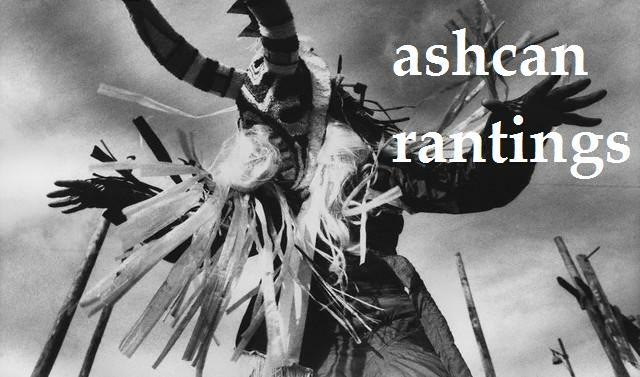 I've talked about this on my blog a few times before, but I really must bring it up once again. I have a weirdly passionate love for Sherlock Holmes. I like the books, but most of all I love the TV show from the 80's and 90's starring Jeremy Brett. To me, he is the absolute perfect Sherlock Holmes. He looks, talks and behaves exactly like I imagined Sherlock Holmes would (and I know he's not real, but he is in my mind). 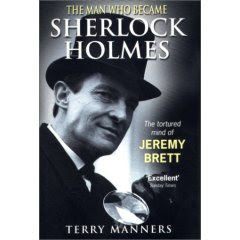 So imagine how excited I was when I was perusing the local library and found this biography of Jeremy Brett, called The Man Who Became Sherlock Holmes: The Tortured Mind of Jeremy Brett. 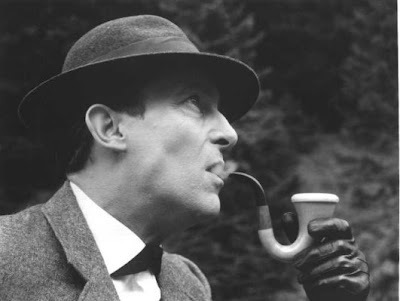 It seems that Mr. Jeremy Brett's life was just as interesting, if not more so, than the fictional Holmes! 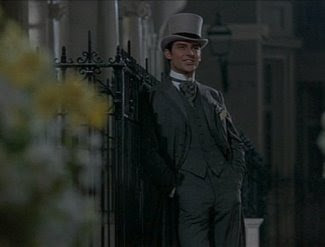 You might recognize him as Freddy from My Fair Lady, a really dull movie I totally hated and probably would've enjoyed more if I'd realized Sherlock was in it. As a young child, he was sexually abused. He later struggled with his sexuality, as well as manic depression/bipolar disorder. He became so obsessed with the Sherlock Holmes role that it eventually took over his life. This is an actor very seriously devoted to his craft and it shows. When I watch the TV show, I feel like I'm watching a reality show following around the real Holmes. Jeremy Brett makes him so realistic. Sherlock Holmes was also a very complex character, who struggled with a drug addiction and lost love. Anyway, Sherlock Holmes and Jeremy Brett are both absolutely fascinating people who I could rant about all day, but I'll leave it at this. Posted by molly at 5:32 p.m.
March 04, 2008 6:47 p.m.
Ohhh. Sherlock. 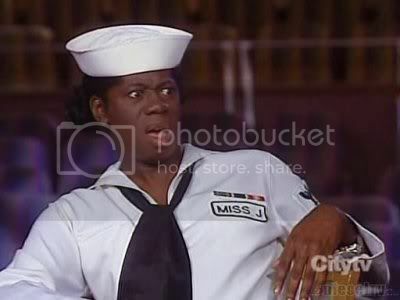 I always watch the specials on PBS when they come on. You've seen The Hound Of The Baskervilles, right? Highly enjoyable. March 04, 2008 9:58 p.m.
YAY he'ss wearing a top hat..I LOVE top hats. March 05, 2008 2:50 a.m. I'm not proud to say this, but the nearest thing to Sherlock Holmes I've heard is his fabulous reputation and an episode in a kiddy show called the Triplets that is about him. Maybe I should start reading the books, I really like all that mystery stuff. March 05, 2008 4:17 a.m. I've never seen the television show but I have read some of the books. I wonder if they have them on DVD yet. March 05, 2008 5:44 a.m.
March 05, 2008 11:51 a.m. I haven't read any Sherlock Holmes books since I was a kid. Now I want to go find them and revisit the mysteries. March 05, 2008 11:53 a.m. So cool!! I am excited to look into this! I have never seen these, but I do love a great mystery! March 05, 2008 2:04 p.m. I remember stopping at the Baker St. subway in London. Wasn't that the street he was supposed to live on? That's what I imagined anyway. March 05, 2008 3:09 p.m.
March 05, 2008 3:19 p.m.
That's so interesting. I love reading about people's lives, especially when they become so associated with one role. March 05, 2008 3:58 p.m.
March 05, 2008 4:10 p.m. I read a Sherlock Holmes story in grade eight and really enjoyed it, I have always ment to read more. I have never seen the show. March 05, 2008 5:44 p.m.
Is it the tophats that get you?? I LOVE Sherlock Holmes!!! 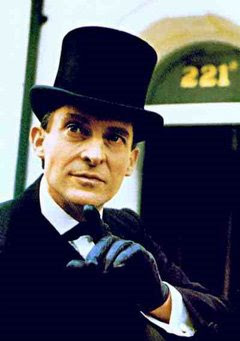 And I agree with you, Jeremy Brett is the perfect Sherlock Holmes! March 06, 2008 7:38 a.m.
Who doesn't love Sherlock Holmes? Except for possibly Holmes himself? Recently did an interview on the inner workers of the literary Holmes that you might find of interest. March 06, 2008 8:01 a.m.
July 07, 2008 4:49 a.m.
August 04, 2008 1:48 p.m.
Actually, a lot of what's in the book you mentioned is made up by the former tabloid journalist author who failed to do any decent research whatsoever.... I strongly recommend true fans of JB to avoid that book. Still, JB was THE BEST Holmes ever and a very interesting man as well. March 03, 2009 8:28 a.m. I'm afraid to say that Terry Manner's book has been *completely trashed* as utter nonsense by those who knew Brett; there's very little of substance to it, particularly to the sexual abuse and his later proclivities. Also the author has NO documentation and no proof of who he talked to, where he's getting his information-- all the usual stuff you need in a biographical volume. It's rubbish, in fact. Trash it. May 28, 2009 11:33 a.m. I think we can safely say that much of the material reported in the Manners book is true, even if the way he reported it leaves much to be desired. Although the abuse claim has not been verified, the fact that he was bisexual has. Many times. March 16, 2011 1:57 a.m.